A century since the first Indian film was made, Bollywood has become the world’s most active film industry. While many eyes have been on China’s exploding box office numbers of late – now the world’s second highest – there is an equally epic world of cinema right next door in India where just as many if not more jaw-dropping figures demand attention. And now is a good time to take note: This month Bollywood turns 100. In the century since the first Indian-made film flickered across a white sheet in Mumbai (then Bombay) on May 3, 1913, Bollywood has mushroomed into a U.S. $2 billion (112.4 billion rupees) film industry. Song and dance, colorful drama and epic stories characterize the films churned out by the Indian movie-making machine, the world’s largest in terms of output. 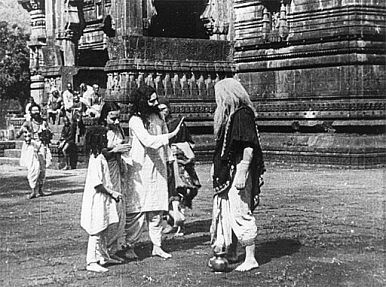 The first feature film produced on the Subcontinent, Raja Harishchandra, directed by an avid photographer named Dadasaheb Phalke, tells the tale of King (Raja) Harishchandra, a monarch who sacrifices all – kingdom, wife and son – to fulfill a promise he has made to a sage named Vishwamitra. In the end, the Hindu pantheon rewards Harishchandra’s dedication by reinstating him to his former seat on high. While he may not have realized it at the time, the dramatic sweep of Phalke’s film set the tone for future Bollywood classics. Reuters tells the story of Phalke’s cinematic obsession, which would inspire him to set in motion an industry that has grown beyond all imagining. Coming from humble origins, as a photographer in the small town of Godhra in the state of Gujarat, Phalke was gripped by a short film he had seen in Mumbai about the life of Jesus. As the story goes, he poured much of his life’s savings into a trip to London, where he purchased a camera. After coaxing an actor into shaving his moustache so his role as a woman would be more convincing, the fervent director launched what must have been one of the first indie film projects. His wife cooked for the film crew of more than 40, held up white sheets herself to function as a screen and even acquiesced to Phalke’s decision to sell off their belongings to fund the picture. This was before Indiegogo. The result – a 50-minute silent, black and white movie – dazzled audiences across India, who queued patiently for the chance to watch the scenes unfold. At the time, few women acted so the film’s female roles required male actors to undertake a delicate balancing act. It was only two decades since the first film commercial exhibitions took place in New York. Over time, Phalke would be regarded as the father of Indian cinema. Bollywood’s reverence for Phalke is seen in its top film prize, which bears his name. By the time of his death in 1944 he had made 95 feature-length films and 25 shorts. Phalke’s prolific output is a microcosm of the film industry he helped launch. Phalke was right. Today, the global footprint of Indian cinema is massive. In 2012 alone, India churned out some 1,500 movies in a plethora of regional tongues. That’s more than double the number Hollywood produces in a typical year. And while Hindi-centric Bollywood may be the national leader, massive regional cinematic traditions tell the stories of India’s other regions, with hundreds of films each year movies featuring dialogue in languages such as Telugu, Tamil, Kannada and Bengali, among many others. An estimated 14 million Indians go to the cinema on any given day, paying an average day’s wages (U.S. $1-3) to see a film. In celebration of this legacy and the national love of film, Bombay Talkies hit theaters last week to rave critical reviews, followed by Celluloid Man. Both movies are odes to cinema and attest to India’s unique contributions to film, which will likewise be honored this month at the 66th Cannes Film Festival, where Bombay Talkies (a four-film anthology that includes an adaptation of a film by legendary Indian director Satyajit Ray) will be shown and a number of Indian stars will walk down the red carpet. Over the course of this month, in celebration of its centenary, we will explore the evolution of Indian cinema, its leading lights – stars, directors and most iconic films – and look at where it might go from here, both at home and abroad. Jia Zhangke’s controversial film has received global praise, but domestic cinephiles may never see it.